Virgil I. 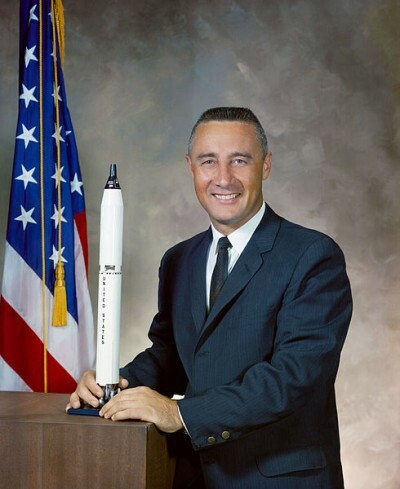 “Gus” Grissom, one of America’s original Mercury Seven astronauts, flew the second U.S. manned space flight, commanded the first two-man Gemini mission and was scheduled to command the first Apollo flight when he died in a tragic launch pad fire. He was born in Mitchell, Ind., on April 3, 1926, and received a Bachelor of Science degree in Mechanical Engineering from Purdue University. Grissom received his Air Force wings in 1951 and flew 100 combat missions in Korea in F-86 Sabres with the 334th Fighter Interceptor Squadron, and, on returning to the United States, became a jet instructor at Bryan, Tex. In 1955, he studied aeronautical engineering at the Air Force Institute of Technology, then went to the Air Force Test Pilot School at Edwards Air Force Base, Calif. In 1957 he went to Wright-Patterson Air Force Base in Ohio as a test pilot in the fighter branch. Grissom was selected by NASA as one of the original seven Mercury astronauts in 1959. He made the second 15-minute suborbital Mercury flight on July 21, 1961, aboard the capsule Liberty Bell 7. After splashdown in the Atlantic, explosive bolts holding the emergency exit hatch inexplicably blew and water filled the capsule, forcing Grissom into the ocean. He was rescued by helicopter, but the capsule sank. He became the first of the Mercury Seven to make a second space trip when he commanded the maiden flight of the two-man Gemini capsule. With him aboard Gemini 3 (which Gus dubbed the “Unsinkable Molly Brown”) was John Young, the first of the second group of astronauts to fly. During a three-orbit, five-hour journey the astronauts demonstrated for the first time that a manned spacecraft can be maneuvered in orbit. Grissom died along with astronauts Edward White II and Roger Chaffee in a fire that engulfed their Apollo I capsule during a launch pad test on Jan. 27, 1967. Grissom is buried in Arlington National Cemetery. His widow, Betty Grissom, lives in Houston. Gus Grissom was inducted into the U.S. Astronaut Hall of Fame on May 11, 1990.